Our charitable crafting group finished filling the donation bags this morning, and representatives from Jardin de los Niños came to pick up 60 Christmas handmade bags each filled with 2 or 3 books, socks/ underwear/ hats/ wash clothes/ blankets, toys, an ornament, and a handmade toy. Many thanks to the many people and groups who helped to make this all possible! 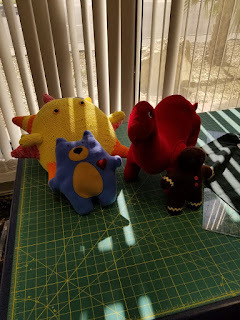 The fourth Saturday meeting of Charitable Crafting was rather quiet. It was me. Don't get me wrong, I think people should have been spending time with their families on that Saturday after Thanksgiving. Or traveling, or napping, for that matter. 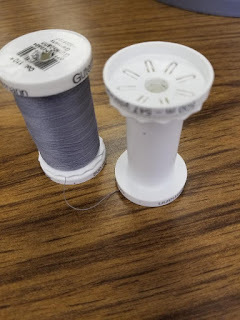 I - on the other hand - haven't been able to spend a lot of time sewing this semester, so that was perfect for me. 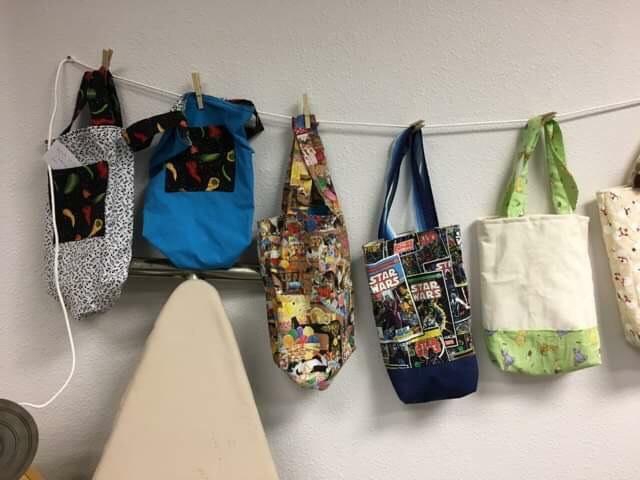 The Christmas Bags Project has been rolling along, and when I got there this morning the bag count was 32, and they are hanging up on the wall, so beautiful! Thanks to Misha, for providing some pictures that I didn't think of taking myself! 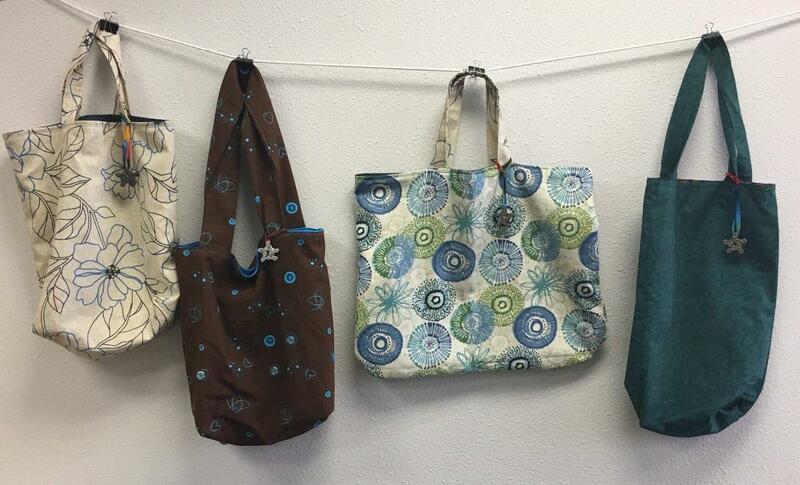 ...in the textile room at Cruces Creatives! 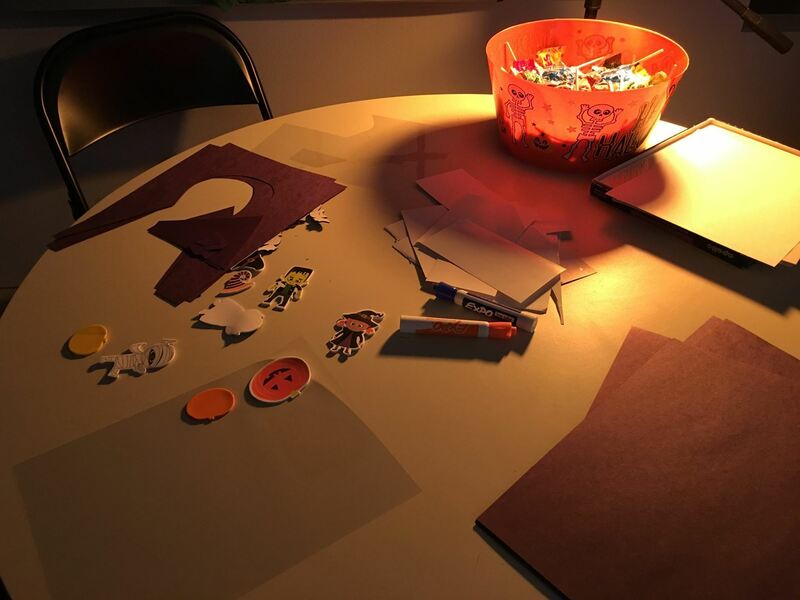 Sarah and I cut out bag kits. Many of these are hanging on the wall now, but there are still kits available if you want one! Did you know there was a bike shop at Cruces Creatives? Well there is, and several of the regulars there got together to make and donate 50 bike chain stars. 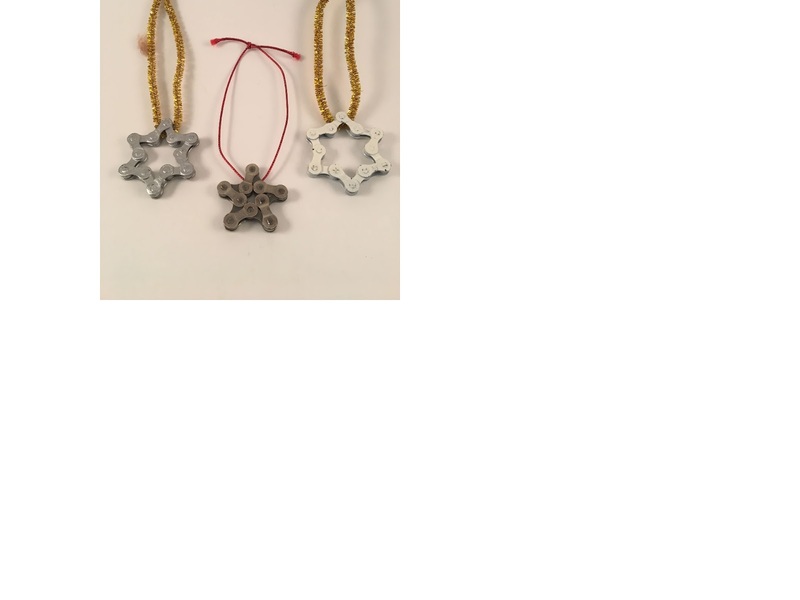 Ornaments for the bags! 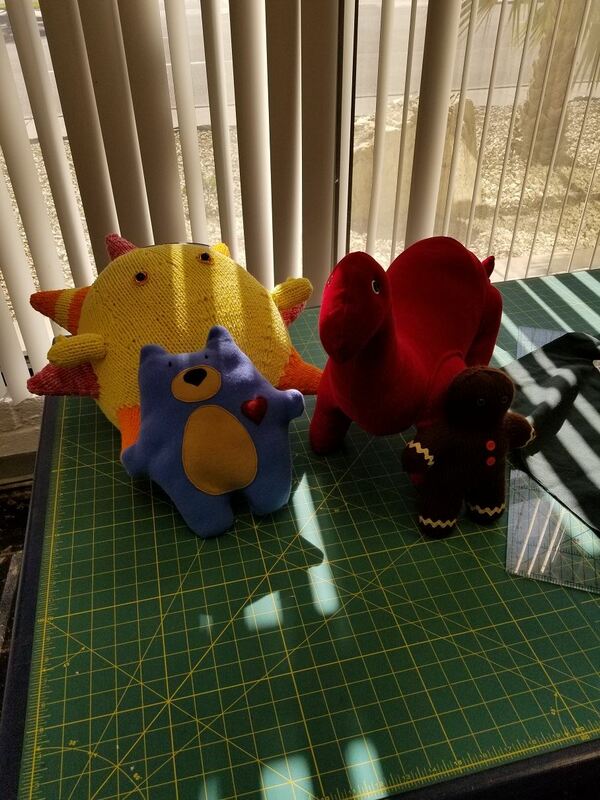 Toys - like these hand-made beauties - have been donated! From this beginning, there are now 3 boxes of books! I am grateful to the point of almost overwhelmed by the generosity and giving spirits of the people who are supporting this project with their handwork and donations. I've also felt a little like I've been falling down on the job when there wasn't much finished that I could point to and say, "I made that!" So, along comes the fourth Saturday of November, and our project is only a couple of weeks to completion and donation to Jardin de los Ninos. While I was happily sewing away, to some calming, happy music, someone came in and dropped off the bags she had sewn up. 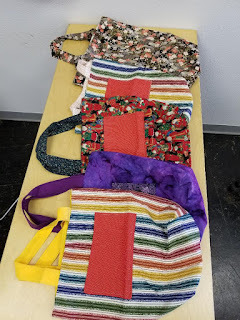 Five beautiful bags! So colorful! And I recognized a couple of the kits from above, Yay! I added them to the wall of bags, along with the two I managed to finish. See, I liked that stripy fabric too! 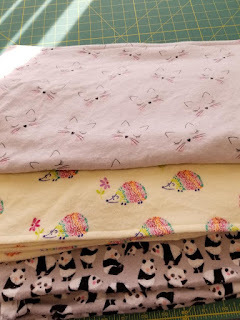 Along with some others that still need hems in (my to-do pile). Who wouldn't love elephants or dinosaurs? Pretty happy with the progress I personally made yesterday. 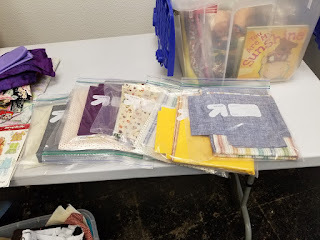 Very happy with the progress that the Project has made - bag count now at 39! Very hopeful that the 50 bags goal is in reach. The additional socks and underwear donation is in the works, I believe. 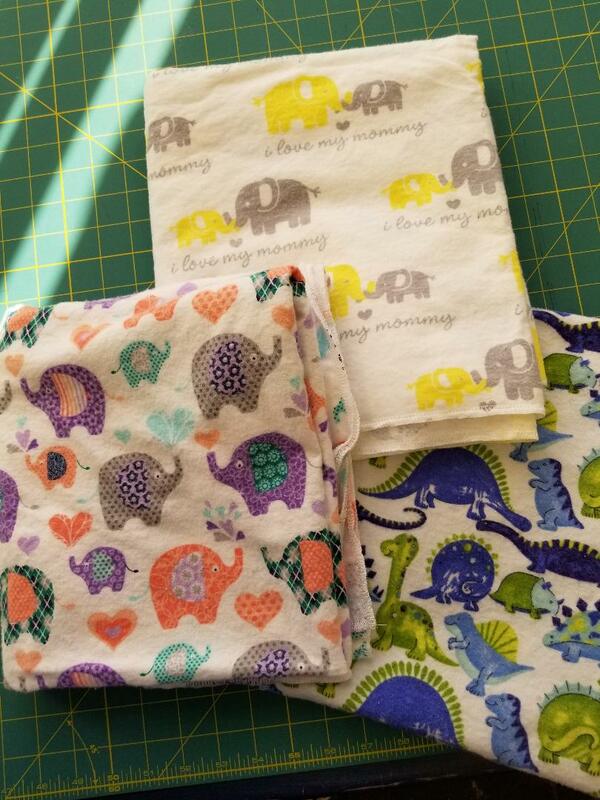 I've also been working on some cloth books for the youngest set of recipients. No pictures of those yet, either... The local SCA group has committed to making and donating toys for the project. Again, thanks to Misha, there are pictures of AWESOME wooden dragon puzzles! I know what you're thinking now... that sounds like a lot of stuff. What if you get more than you need for the 50 bags? 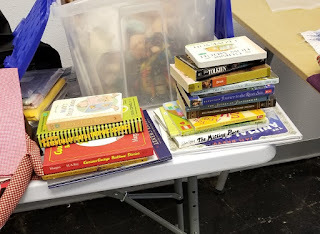 (you've looked at the book donations, haven't you?) The plan is to donate any extra anything to Jardin to use, or donate to patrons, as they see fit. 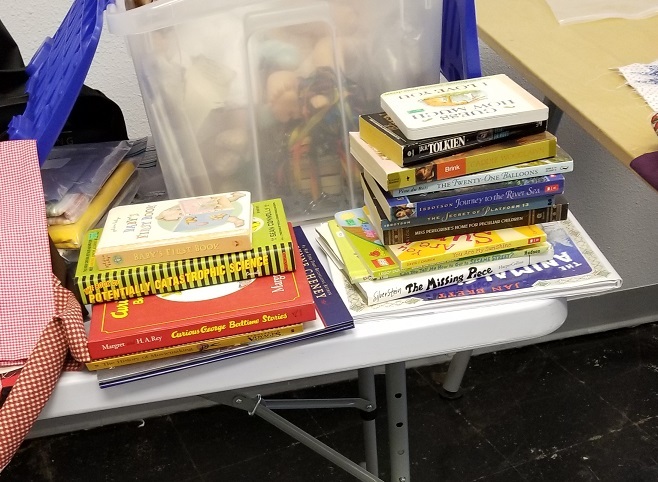 More books for their classroom libraries? Yes, please. From full to empty: a journey of making. One final thought. Progress is often measured in the product created. It can also - and as importantly be measured by the trail that creation has left. Something that I think of when I empty a spool of thread is all the work that empty spool represents, and that, too, is an accomplishment. Cruces Creatives, in partnership with six other organizations, has been awarded its first grant: $30,000 for a program to identify and address obstacles to regenerative agriculture in New Mexico. An executive summary of the program follows. Farmers and ranchers can achieve many benefits by more closely following natural models. By cultivating continuous vegetative cover, minimizing tillage, and inoculating soils with the beneficial microbes in soils where the microbiota has been destroyed by conventional practices, farmers can increase crop yields, increase soil nitrogen through the work of free-living nitrogen-fixing bacteria, increase soil carbon, increase soil water infiltration, increase soil water retention, and prevent or reduce topsoil loss (Johnson et al. “Soil Microbial Communities,” Johnson “Carbon and Nitrogen Partitioning,” Johnson “Influence in Agroecosystems”). Similar benefits can be achieved on ranchland through soil microbiota restoration and by imitating the high-intensity, adaptive grazing practices that nature developed with wild ruminant herds. In this proposal, we refer to these practices collectively as “regenerative agriculture,” and these practices can address water scarcity, food scarcity, climate change, biodiversity and habitat loss, and farm and ranch profitability and long-term viability. The large-scale benefits are known. The challenge now is adapting current practices. Unfortunately, the process of adapting new practices is notoriously slow in the field of agriculture—often taking decades—and the global challenges facing us do not leave us that time. In this collaborative proposal, we propose to work around or address the obstacles impeding the widespread commercial implementation of regenerative agriculture. There are multiple obstacles to the widespread commercial use of any new farming or ranching practice: technical hurdles, such as difficulty translating lab-based agricultural research to the realities of the field or range (Parnell et al. ; Kellett; Dau); economic obstacles, such as difficulty raising capital funds or uncertainty about return on investment (Hepperly 45, 48; Carr), regulatory hurdles (Parnell et al. ; Hepperly 54-55); knowledge barriers, such as unfamiliarity with required tools or processes (Hepperly 50, 188-189); negative perceptions of science among farmers (Hepperly 35-36); differences in culture and professional expectations among farmers, scientists, and policy makers (Maat 187); and communicative obstacles among farmers, scientists, and policy makers. For regenerative agriculture in New Mexico, many of these obstacles have already been removed. Each geographic area, and perhaps each farm, will have its own technical hurdles, but the major and widespread issues have been overcome, with several commercial farms and ranches around the United States having implemented regenerative agricultural approaches successfully (Byck “Soil Carbon Cowboys”; Byck “100,000 Beating Hearts”). Economic obstacles are still formidable, but they can be manageable: capital funds can be raised through loans from organizations such as the U.S. Department of Agriculture, and although more information about return on investment would be valuable (one goal of this project is to generate more such information), multiple pilot projects at the commercial scale will attest to the economic viability of regenerative agriculture. In New Mexico, regulatory systems do not impose direct obstacles, even though regulations could be improved by creating new policies that recognize and reward soil carbon capture. In New Mexico, the most substantial obstacles are political, cultural, and knowledge-based. Collectively, our collaboration is poised to address each of these remaining obstacles. Our plan for change, in essence, is modeled on how beneficial adaptations can originate and spread through ecological communities: a small group, well positioned for change, adapts; the adaptation proves beneficial; the adapted individuals interact with other individuals; and the adaptation spreads. In many instances of social behavior, groups follow “tipping point” theory, and once a small, critical mass of practitioners has been reached, a new behavior can quickly spread through an entire group. Our goal is to build regenerative agriculture in New Mexico toward its tipping point. Research conducted by collaboration team member Patrick DeSimio through the MESA Project (see “Partner Organizations”) has found that, in Doña Ana County, sizable minorities of farmers and ranchers are largely not subject to the political and cultural barriers that typically impede the implementation of sustainable agricultural technologies (2018, pp. 55 and 67). This subgroup of agriculturalists views environmental degradation as a significant threat, accepts mainstream scientific consensus on human impacts to climate and the environment, and shares a substantial technical vocabulary with agricultural scientists. Most members of this subgroup have already implemented sustainable practices on their farms or ranches. For members of this group, which we call a “Seed Group,” cultural and political beliefs are no longer obstacles to regenerative agriculture; rather, these beliefs can be motivating assets. Consequently, when working with a Seed Group, the only substantial obstacles to regenerative agriculture are knowledge barriers (which can be addressed through training) and possible technical hurdles associated with on-the-ground conditions as specific farms. Technical hurdles always require innovation, but they can be addressed. Our proposal is to work with members of Seed Groups—who are part of our existing networks—to implement regenerative agriculture on their farm and ranch land throughout New Mexico, to collaboratively address the inevitable technical hurdles, and to collectively design and perform economic and scientific research to accurately gauge the net economic and environmental benefits of regenerative agriculture. With the Seed Groups as models and guides, we will then collaborate to facilitate interaction and exchange between Seed Group members and other agriculturalists in their communities, promoting the spread of regenerative agriculture (a beneficial adaptation) through larger sections of the agricultural community. The goal is to reach a tipping point beyond which regenerative agriculture becomes the new normal. Members of the Seed Groups will be drawn from our existing networks (almost 100 members of a Seed Group are already involved in the MESA Project in Doña Ana County) and through promotional materials that explicitly identify with sustainable agriculture and its benefits in relation to environmental threats. This project plan relies on the collective expertise and abilities of each project partner. The Institute for Sustainable Agricultural Research (ISAR) at New Mexico State University (NMSU) is a global leader in regenerative agriculture, especially the cultivation and use of beneficial soil microbes, and ISAR will provide technical and scientific support for this project. Similarly, the Sustainable Agricultural Science Center (SASC) at Alcalde will provide scientific and technical expertise on regenerative agriculture and will provide a testbed for research. The MESA Project, Acequia Madre del Rio Lucero y del Arroyo Seco, Rivers & Birds, and Western Landowners Alliance offer established connections with farmers and ranchers throughout New Mexico, as well as a wide range of resources that can support regenerative agriculture in New Mexico. The Western Landowners Alliance, with its extensive history of successfully influencing policy, will work to impact policy and facilitate regenerative agriculture. 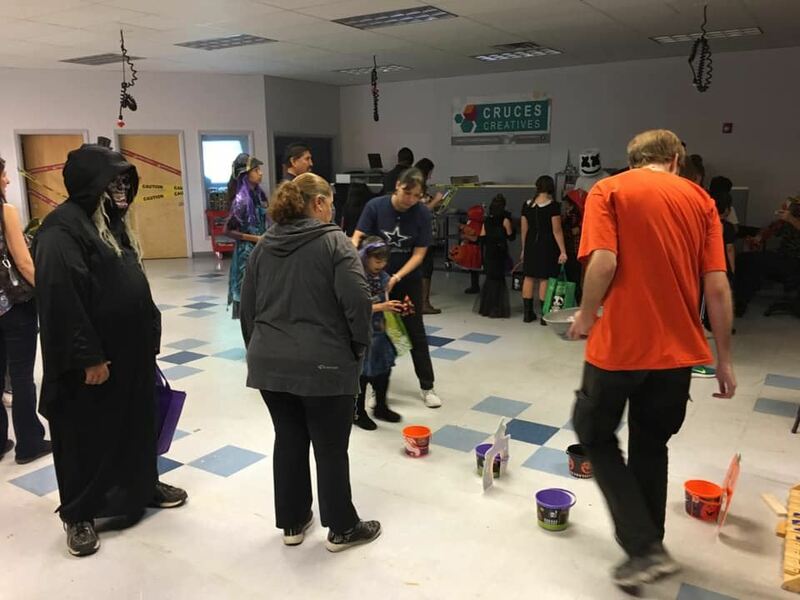 Cruces Creatives, a makerspace in Doña Ana County, will offer technical support through rapid prototyping and a broad network of community experts who can help farmers and scientists quickly develop needed technologies and equipment for regenerative agriculture. Each partner organization also has connections to policy makers, offering the chance to create an organized movement behind any needed policy changes. Carr, Geoffrey. “The Future of Agriculture.” The Economist, June 9, 2016. Dau, James. “From Lab to the Field, Research Takes Food Where It’s Needed Most.” n.d.
Johnson, David C. “The influence of soil microbial community structure on carbon and nitrogen partitioning in plant/soil ecosystems.” (PrePrint) PeerJ, March 2, 2017. Parnell, J. Jacob et al. “From the Lab to the Farm: An Industrial Perspective of Plant Beneficial Microorganisms.” Frontiers in Plant Science 7 (2016): 1-12. 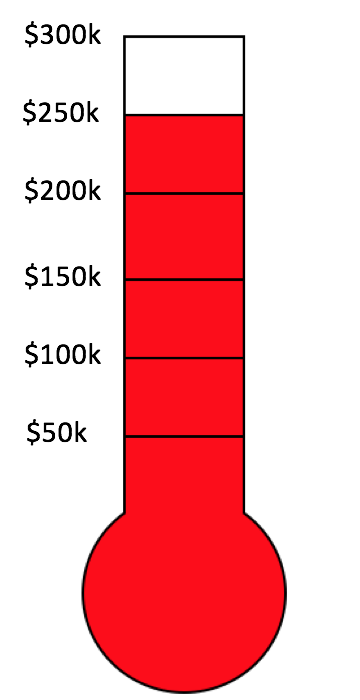 As a community this year, we’ve raised over $250,000 to establish and equip the makerspace. 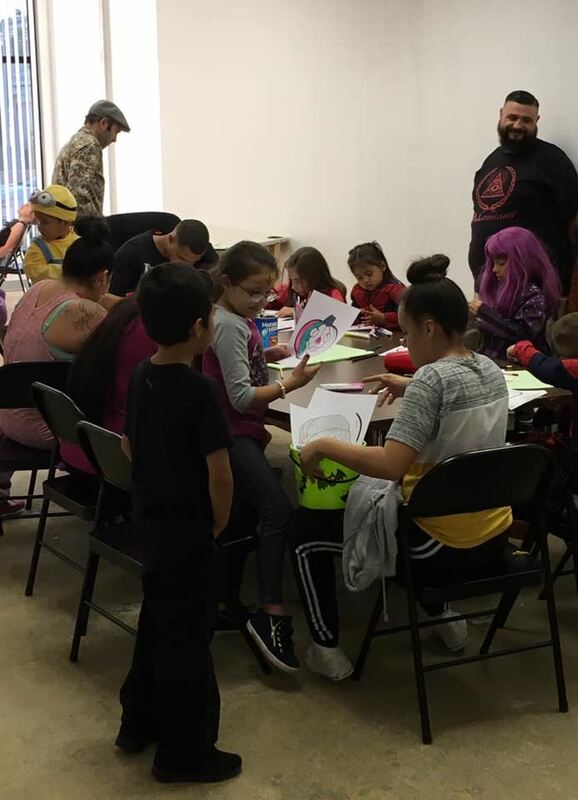 If we can raise $50,000 more, we can bring the makerspace through its startup period and establish Cruces Creatives as a permanent resource for everyone in Las Cruces. We’re already 5/6 of the way there! 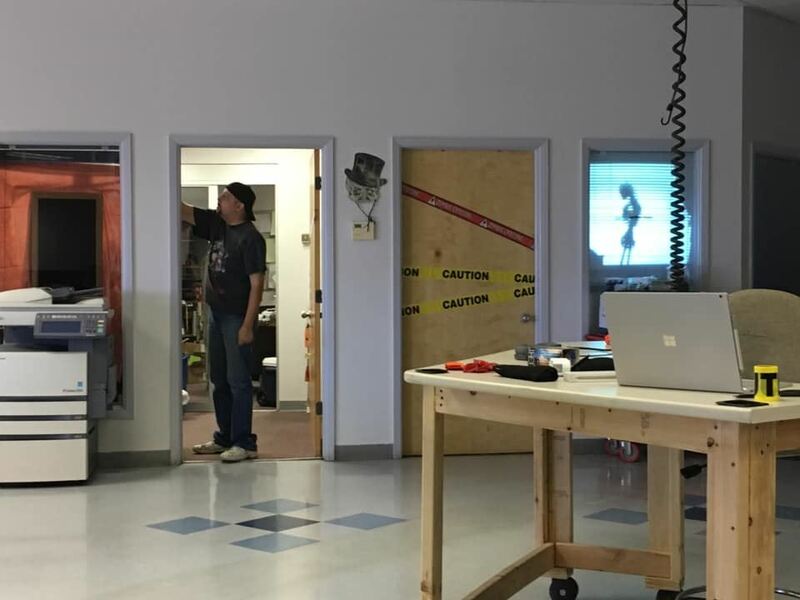 If you appreciate the makerspace and what it does for the community, please contribute. 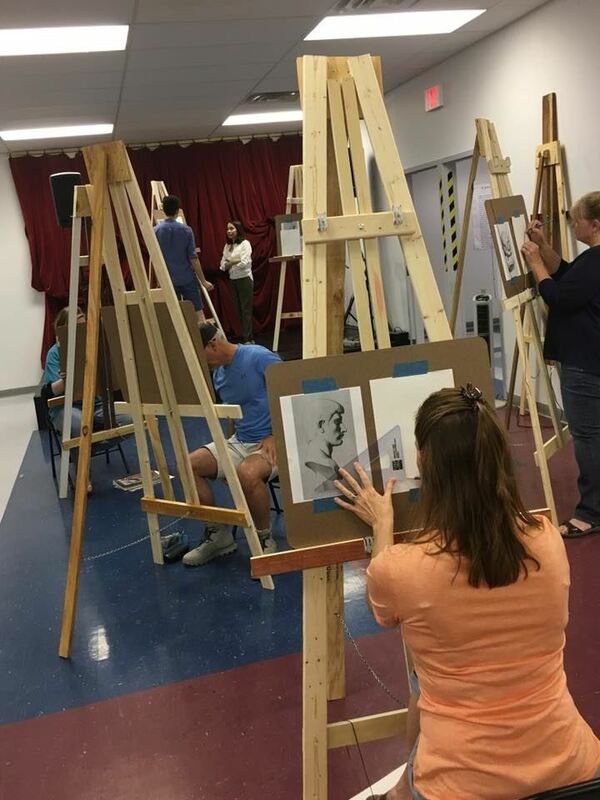 Cruces Creatives is on track to be entirely self-sufficient in 2019. If we can maintain this growth (and there are plans in place to increase it), Cruces Creatives will, by 2019, be able to pay for all of its expenses using revenue from memberships, programs, and events. The current donations of $250,000 in tools, time, and money have made Cruces Creatives a mighty special space. 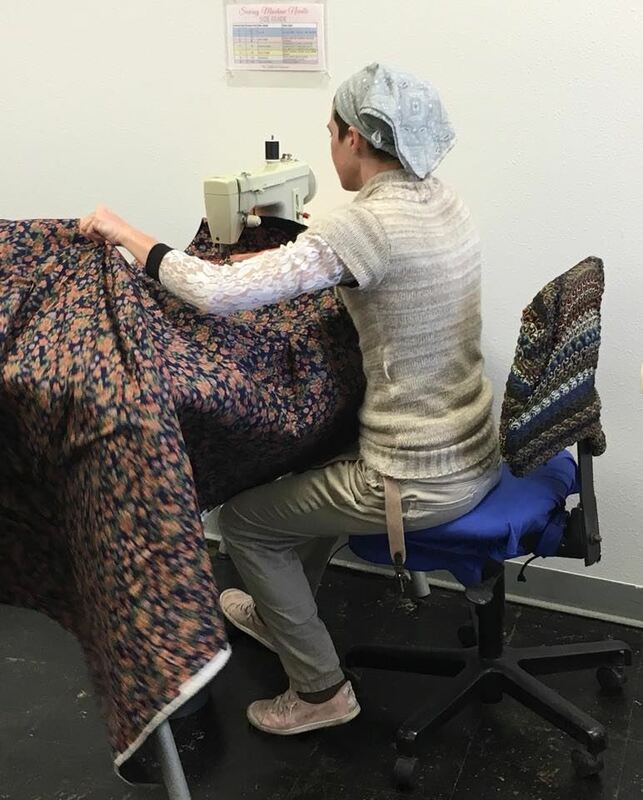 With the Home Stretch Fundraiser, your contributions can bring Cruces Creatives through the remainder of the start-up period and turn the makerspace into a permanent asset for Las Cruces. 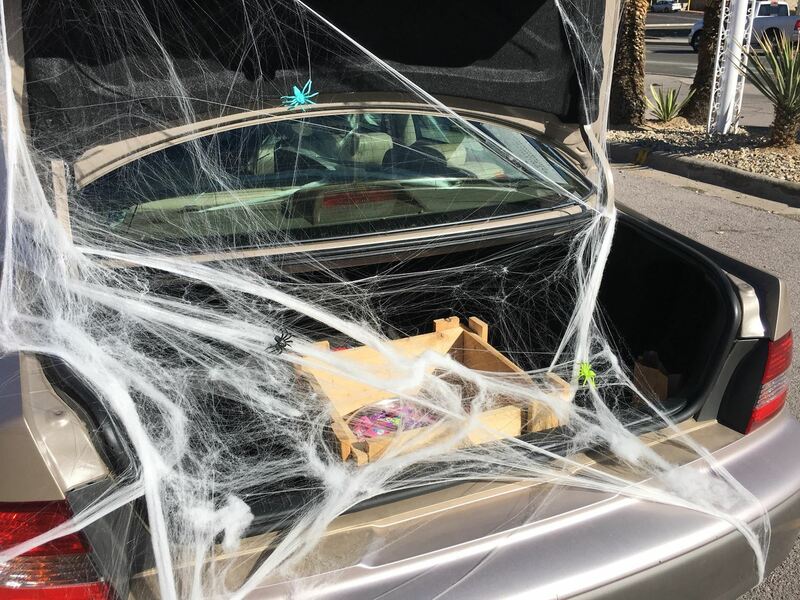 The first Cruces Creatives Trunk-or-Treat was a wonderful success! 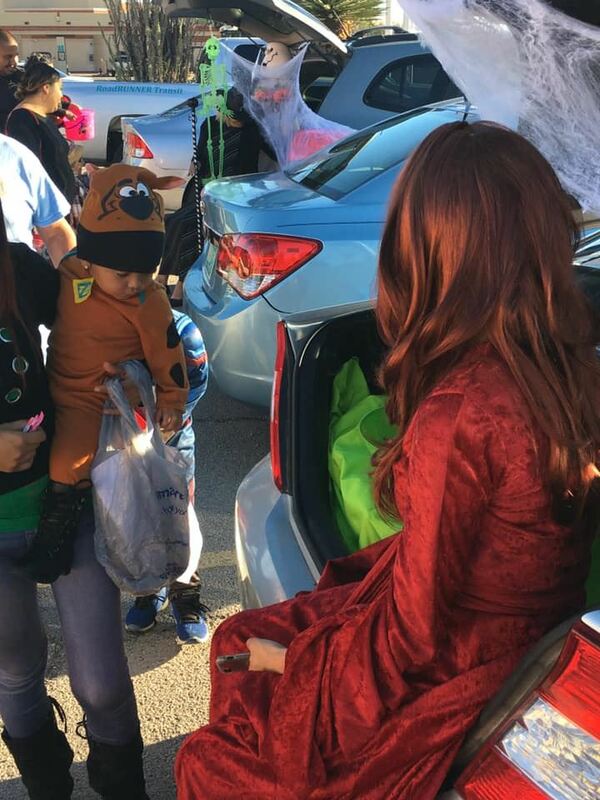 At least 400 kids and families came through the doors to do crafts, face-painting, shadow puppetry, and games, photo shoots, bouncy-house jumping, go through our decorated trunk-or-treat cars, and more. 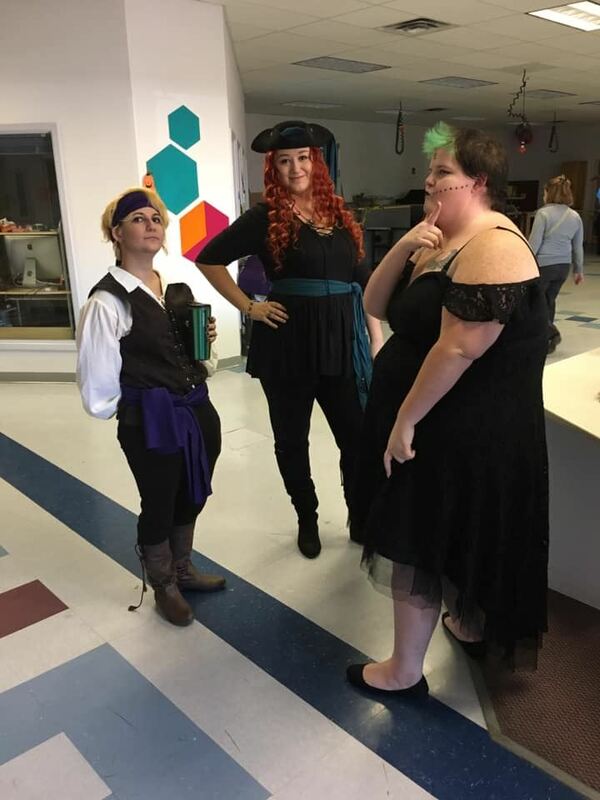 Just a few of the amazing costumes that came through! 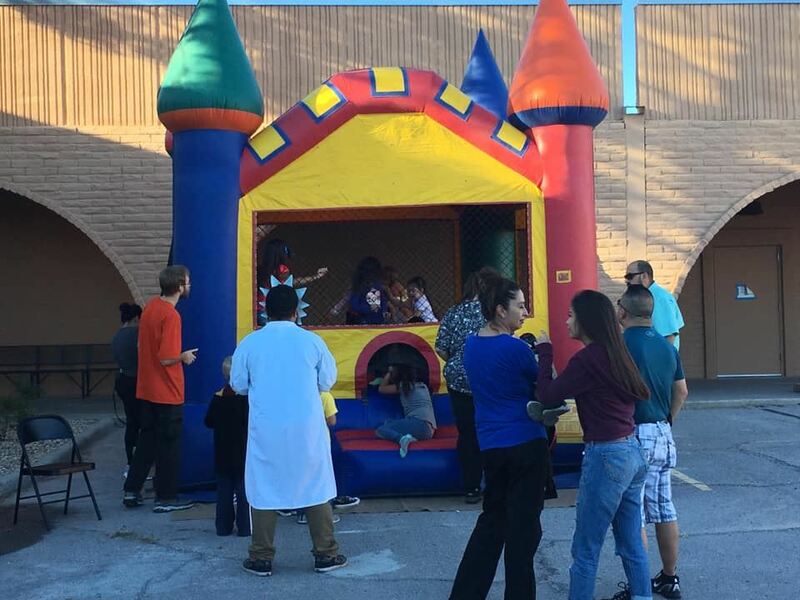 Bounce-house - have to burn some of that candy off! 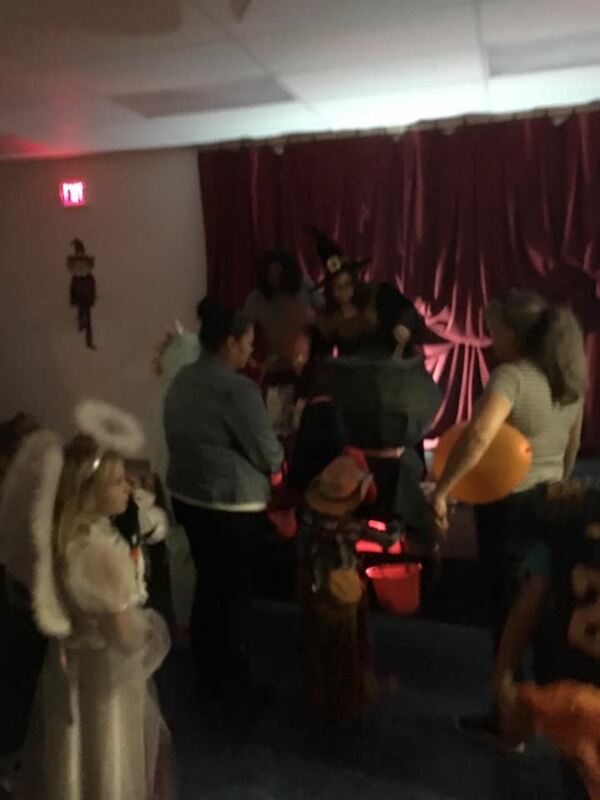 Crafts and cotton-candy from a caldron! Makerspace made decorations all over! 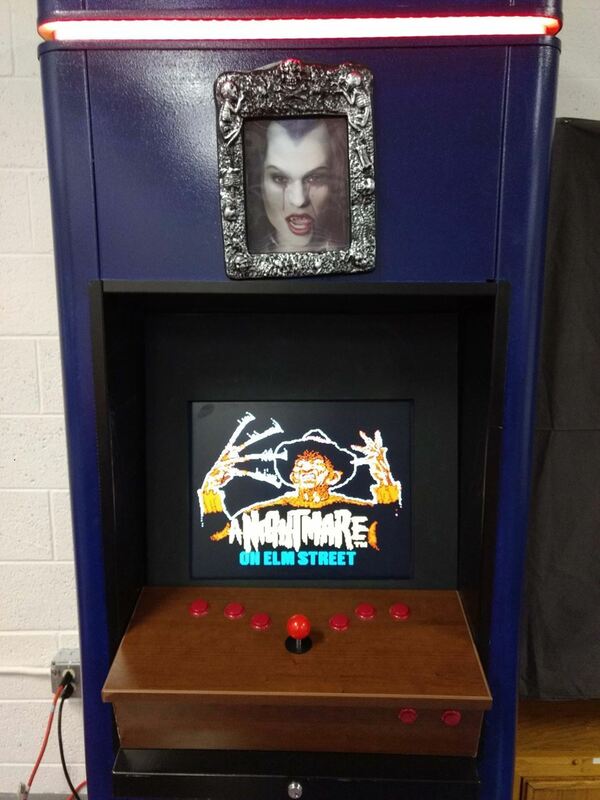 Even the in-house made arcade system was in the holiday mood! It was a wonderful night. 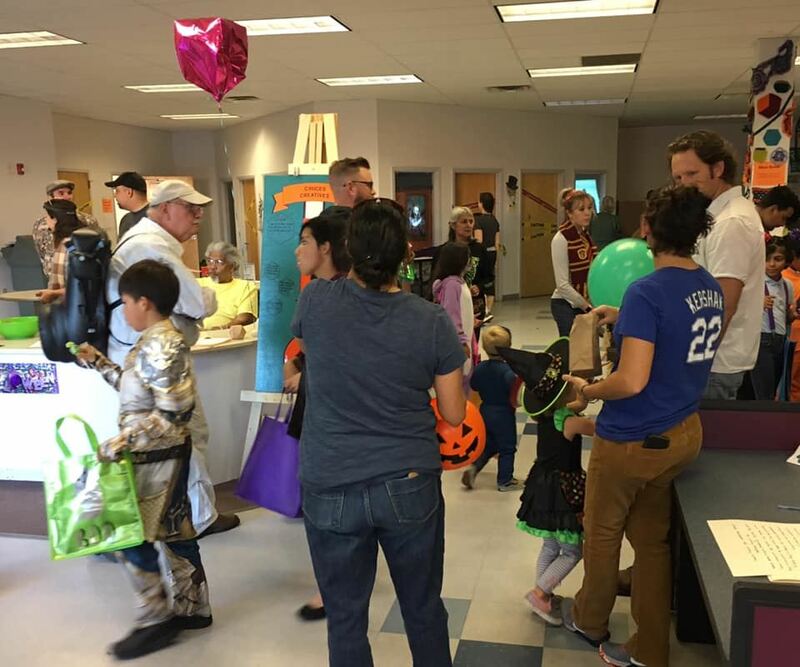 A great big thanks to the many volunteers who made this event possible and to all the families who made it out. 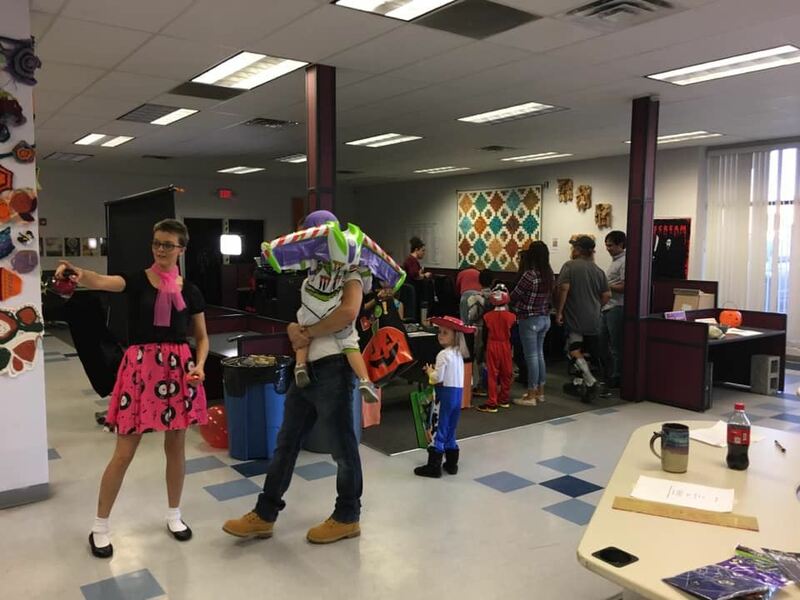 Just some of the many volunteers who made this year's Trunk-or-Treat possible - thank you! 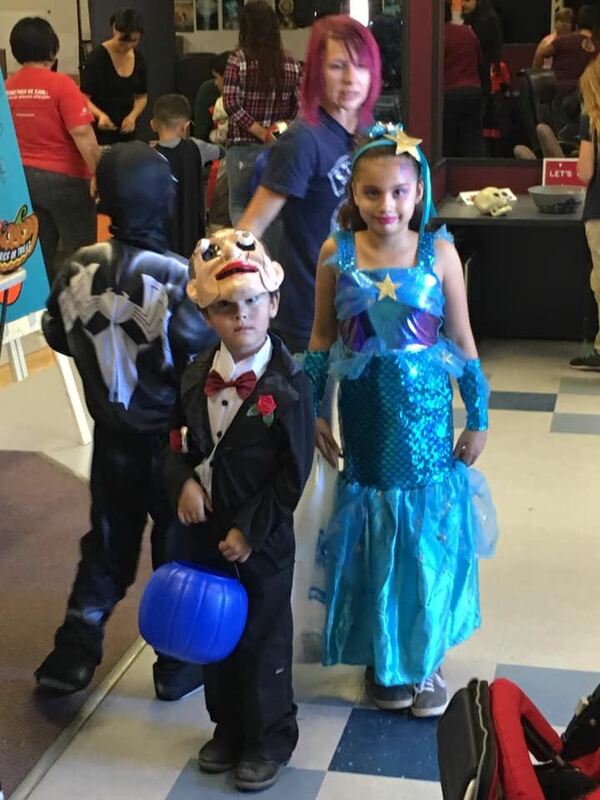 Welcome to the October 18 issue of the Cruces Creatives weekly newsletter. 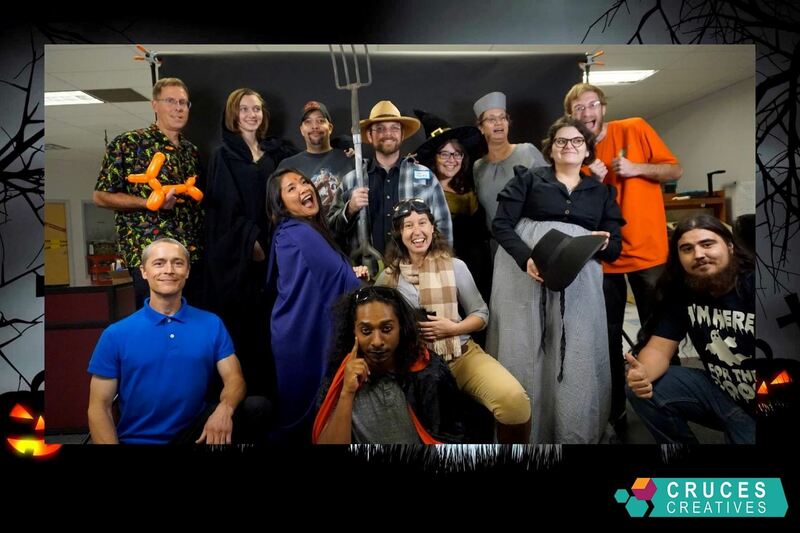 This is a place where you can see a calendar of upcoming events, keep up-to-date with big news at the makerspace, and learn about cool projects that your community members make. This newsletter will be published each Thursday. 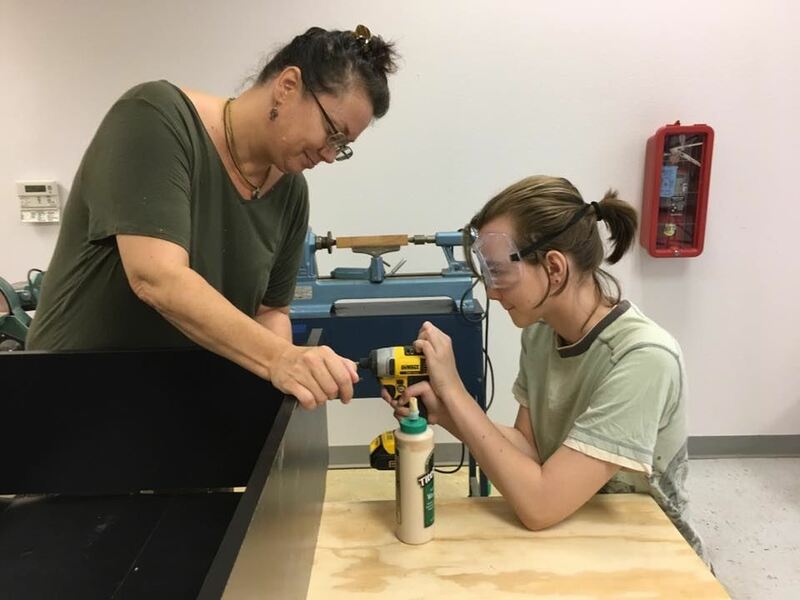 If you have makerspace news or announcements that you’d like to submit for the weekly newsletter, please email Pat DeSimio (p.desimio@crucescreatives.org) by 5:00 p.m. on Tuesday. 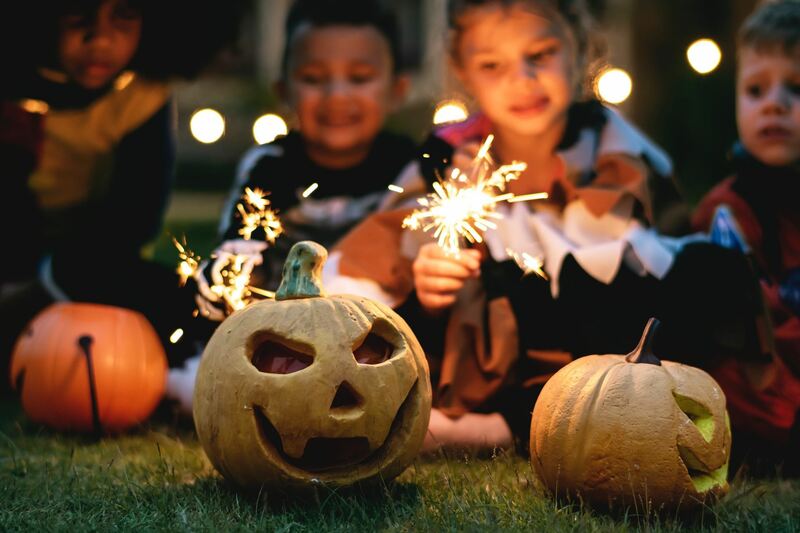 Looking for a safe place to Celebrate Halloween with your kids? 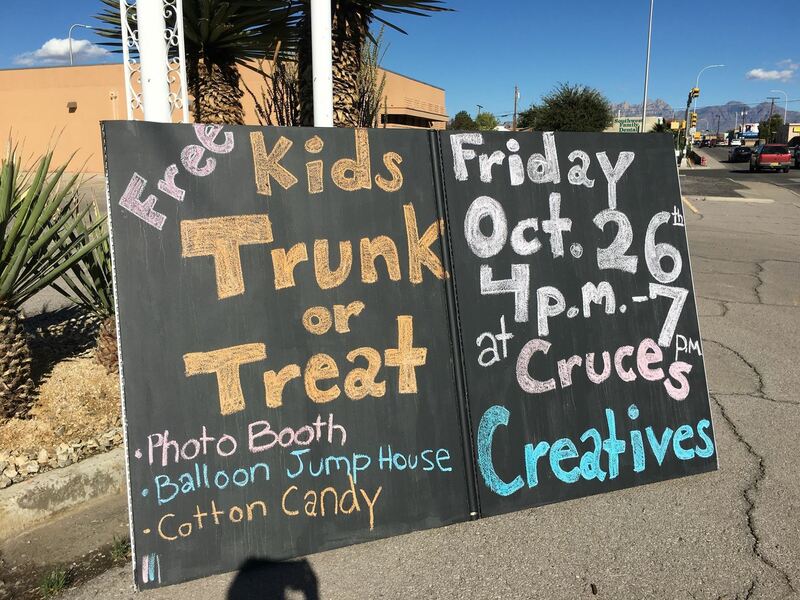 Come to Cruces Creatives for games, movies, Teal Pumpkin treats, photo ops, popcorn, cotton candy, and more—plus, use the private parking lot to trunk or treat. For more information, visithttps://crucescreatives.org/event-3099105. 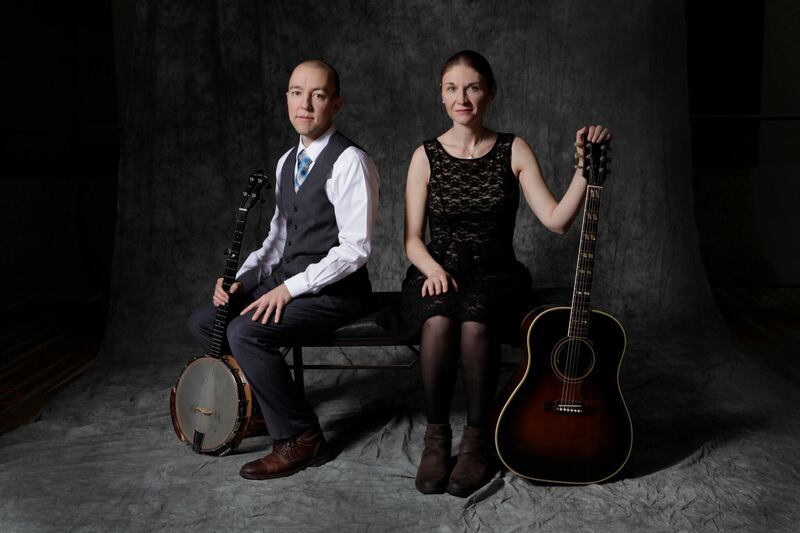 Folk music duo Ordinary Elephant, Artist of the Year atthe 2017 International Folk Music Awards, will be sharing songs and insightsinto songwriting from 7:00-9:00 p.m. on Friday, November 2. Tickets areavailable by donation at the door and at https://crucescreatives.org/event-3098771. Members get 10% off all paid events, entry to member-only events, plus access to tools, space, community and more. 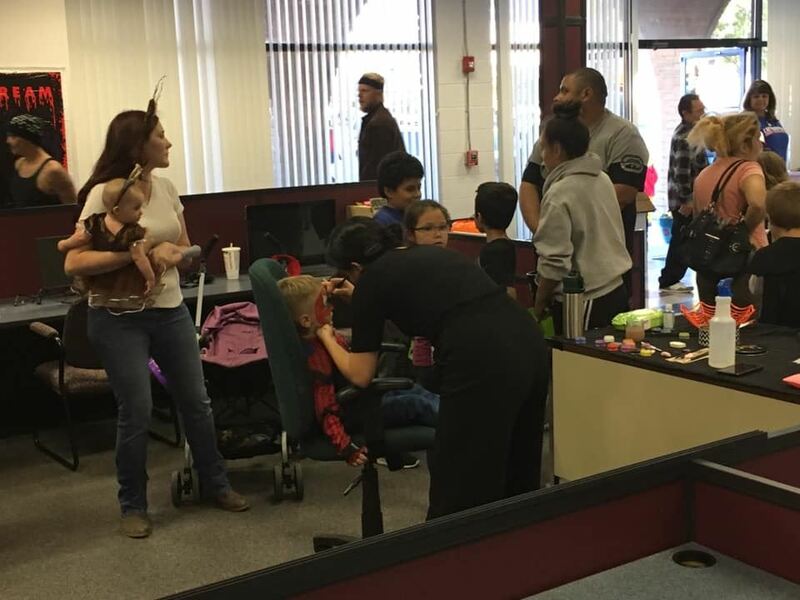 LAS CRUCES, SEPTEMBER 13, 2018-- The Cruces Creatives makerspace is proud to announce that it has formally become listed as a vendor with the New Mexico Division of Vocational Rehabilitation (NMDVR). 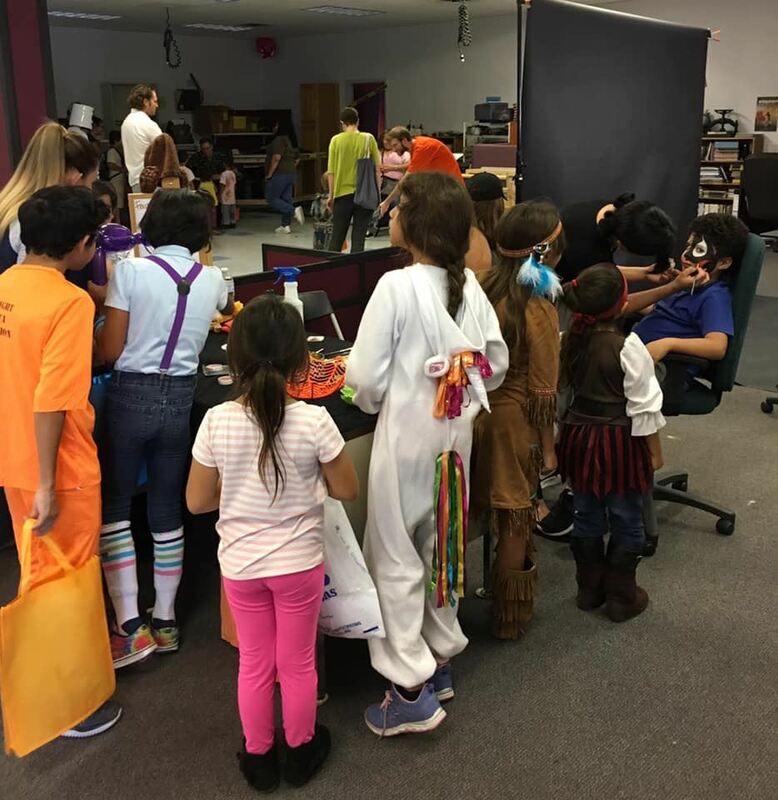 With this listing, people receiving services from NMDVR can have an annual membership to the makerspace included as part of their work plan. If you or someone you know are already receiving or could benefit from the services of NMDVR and feel that they could also benefit from the wide variety of skills training and tools available at the makerspace, call the Las Cruces DVR office at (575) 437-6550 ask about adding a Cruces Creatives Membership to your work plan today. 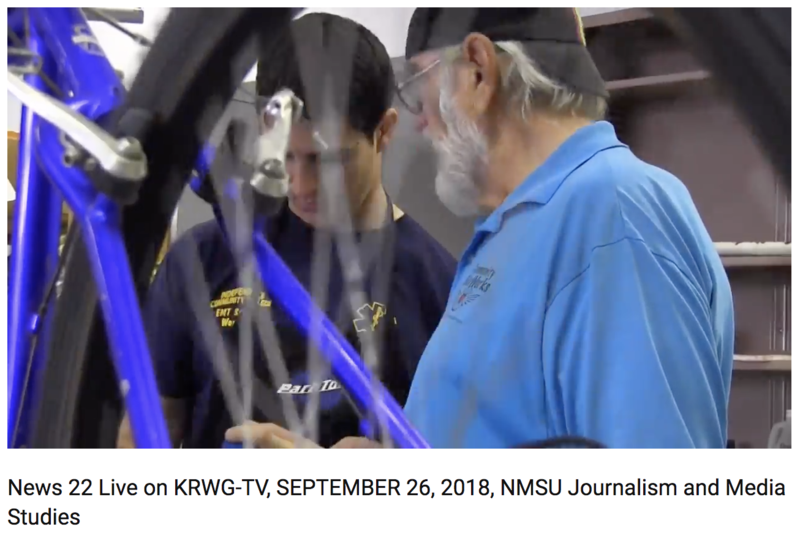 Recently the Velo Bicycle Hub, located in Cruces Creatives, was featured on News 22. The Hub is featured between 6:00 - 8:15. Fall is officially in the air, with the Autumnal Equinox. Time to get crafting for Christmas! The first crafting project of making kids clothes for school is winding down. 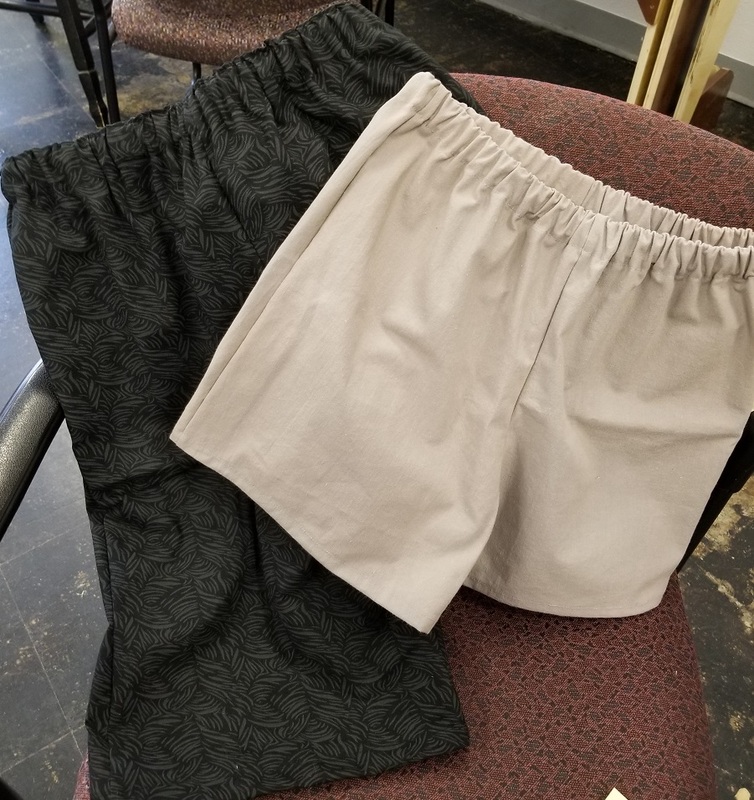 Yes I finished a couple more pairs of shorts, and there are a few other garments to collect, and donate, but it is time to look forward to the next project. So, let me tell you about our next project! We are making tote bags, and then filling them for Jardin de los Ninos to give away to the families they serve. 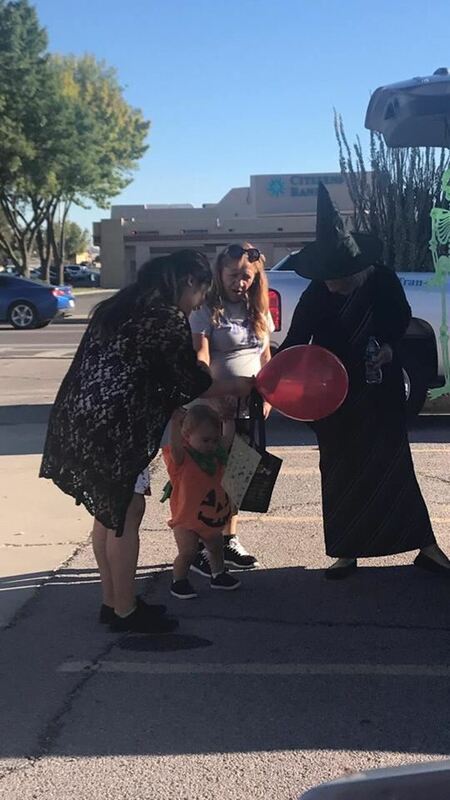 Jardin de los Ninos is an early childhood education center that serves homeless, and nearly homeless children and their families, here in Las Cruces. Every year they give some gifts to the children in their programs, and their siblings. This year they predict they will need gifts for about 50 children. 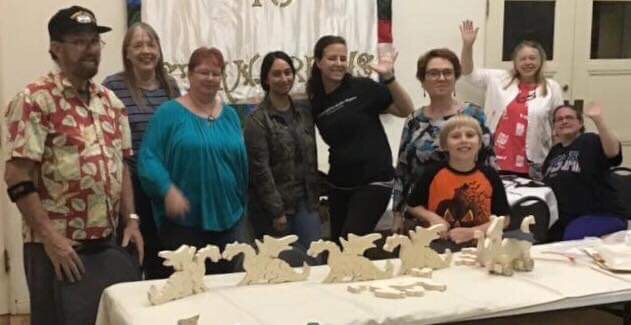 Charitable Crafting is teaming up with Cruces Creatives Makerspace to provide those 50 children with gifts. 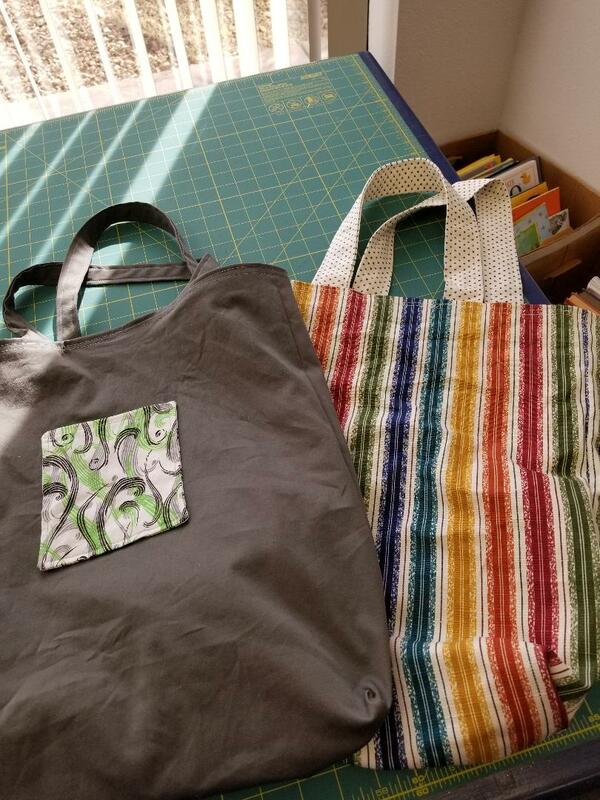 First step, tote bags. A cloth tote bag is a useful item for nearly anyone, and easy and fun to make. Like last time, the project has inspired someone to take flight. 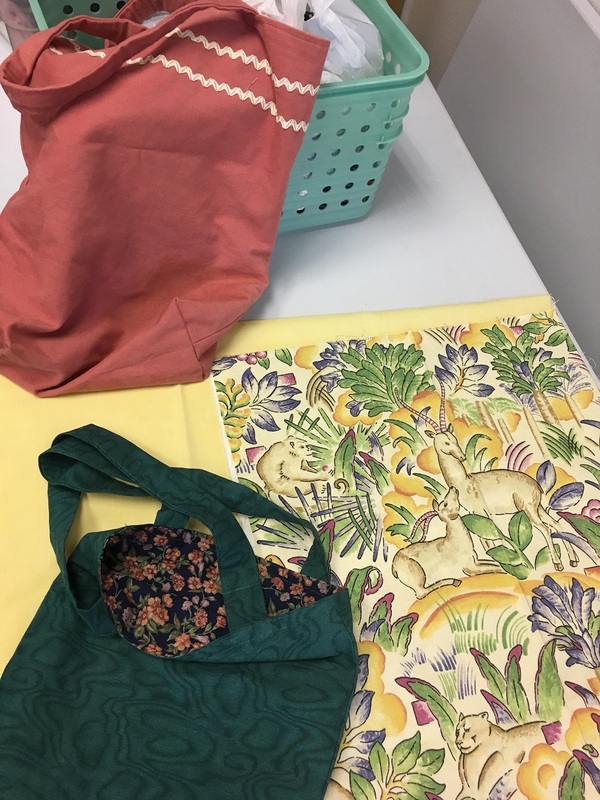 Sarah Jones has been working on a pattern, that she will post on the Cruces Creatives web site, for anyone interested in making (and hopefully donating) a tote bag to our efforts. Of course we won't require all totes to be the same size, but we are looking at 13" wide x 15" tall x 4" deep, or there about. 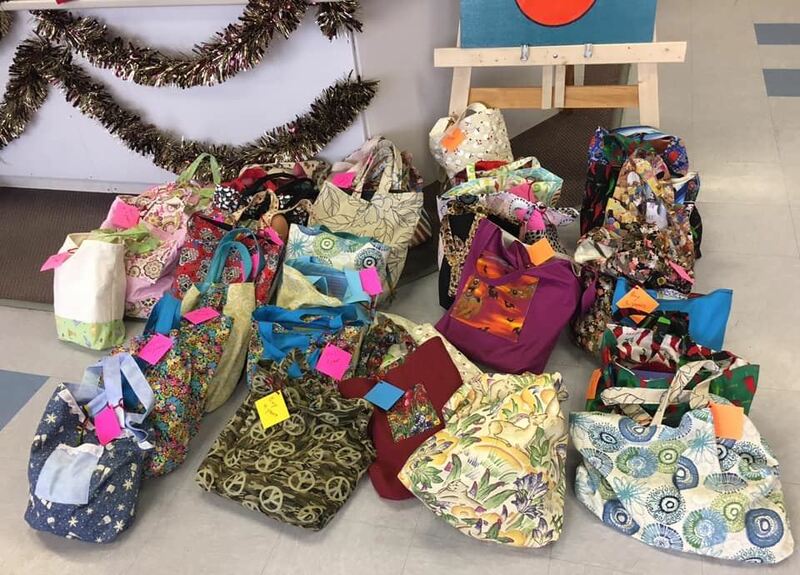 We are also - if you can tell - not concentrating on Christmas-y totes, as we want our recipients to be able to use them year round. If you aren't sure how to make a tote, Sarah is also working on a beginner sewing class and the project will be, you guessed it, a tote bag. It's a great beginner project, really! 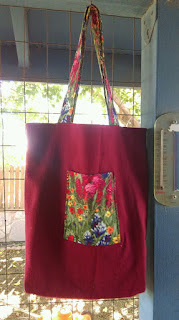 Sarah's latest tote, Love the floral! October 10th is also our next meeting. 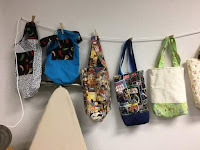 So I hope you can join us cutting out tote bags, or sewing one up! Did I say our goal was 50? It is! Do you need more inspiration? 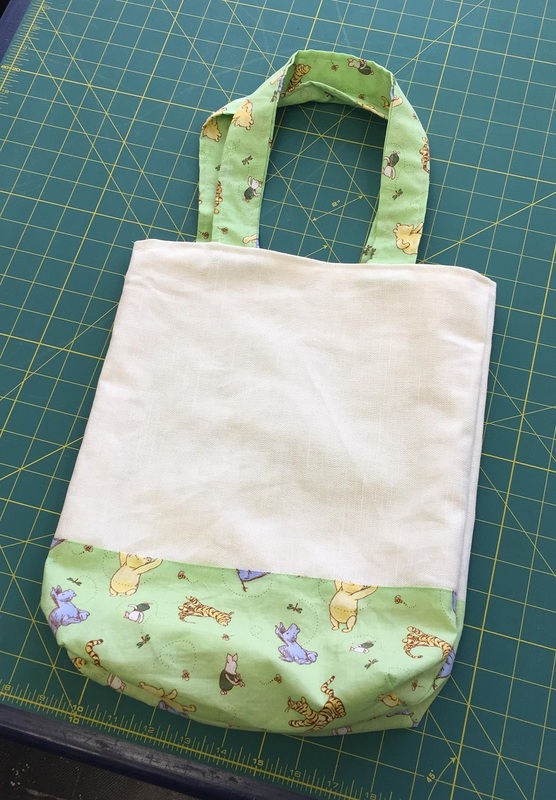 How about this bag made of linen and cute Winnie the Pooh fabric! 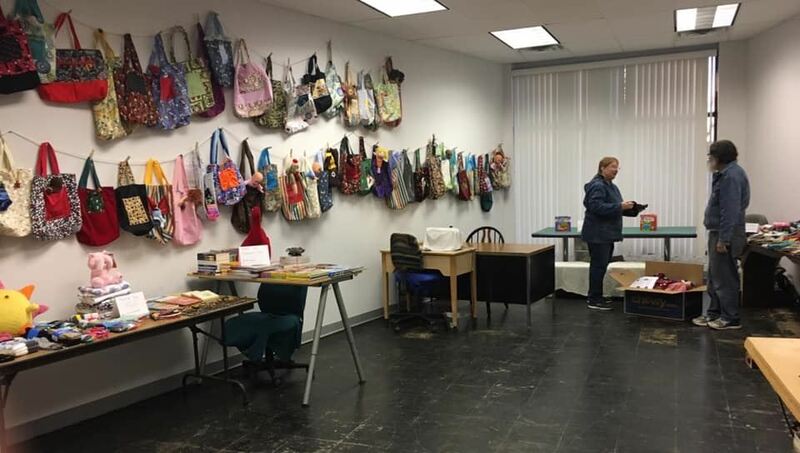 Local makerspace spotlights community artists and creatives. 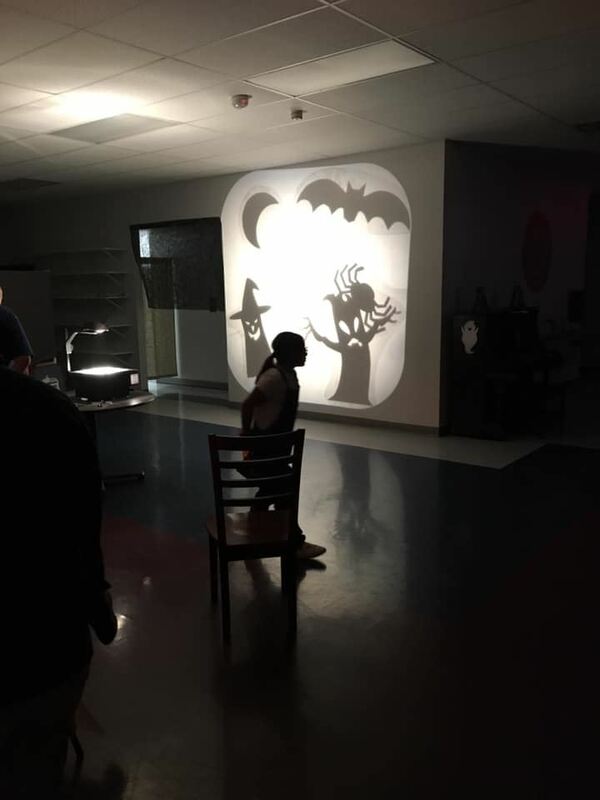 LAS CRUCES, SEPTEMBER 21, 2018 --The Cruces Creatives makerspace is proud to announce that it has begun production on a new documentary web series, “Maker Docs,” which highlights local artisans and creators. The episodes will be released over the course of the next year. 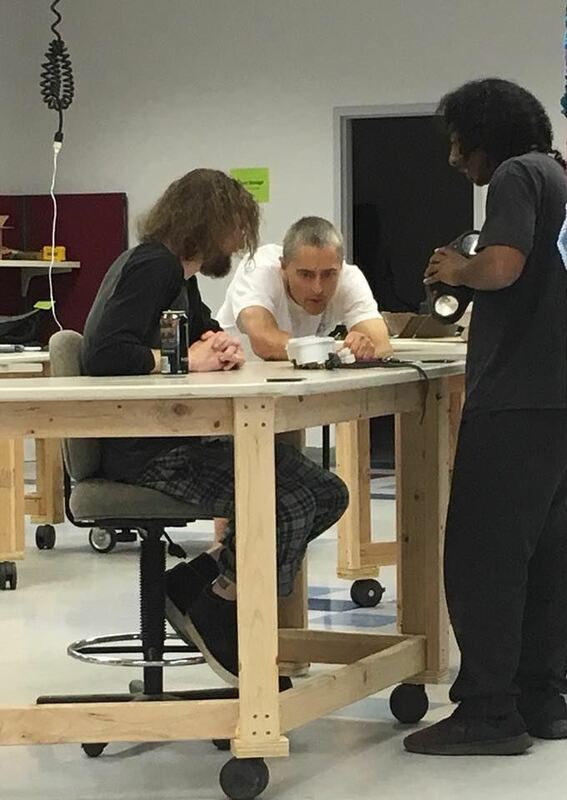 The team at the Makerspace has tapped Micah Pearson, a local author, artist, and community advocate to write and direct the series in his directorial debut. 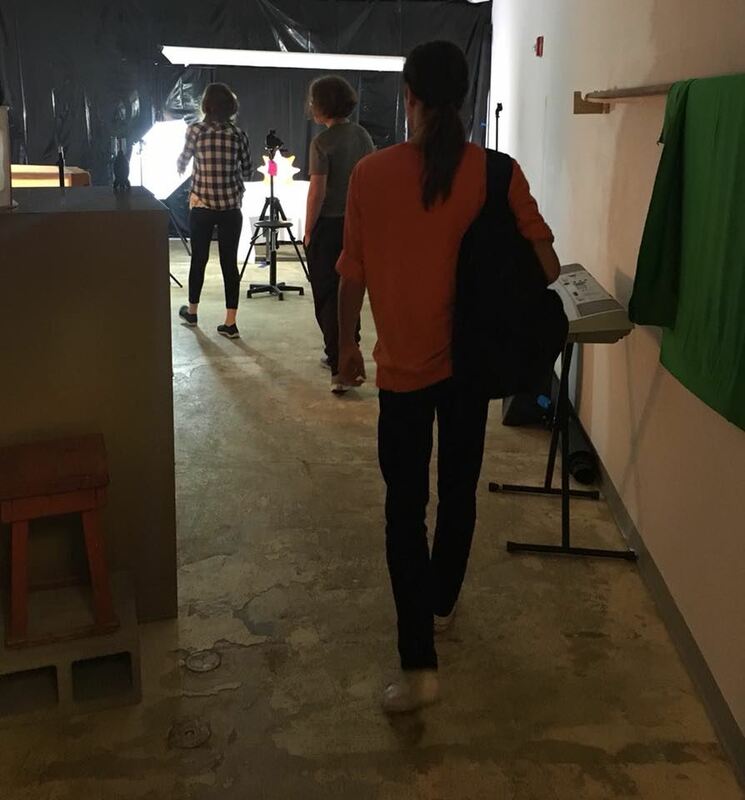 The pilot has completed principal photography and is currently in post production with additional episodes to be filmed in the coming weeks. The first four episodes will be released online on a regular schedule to be announced at a later date, with the following episodes to be released as they are completed. 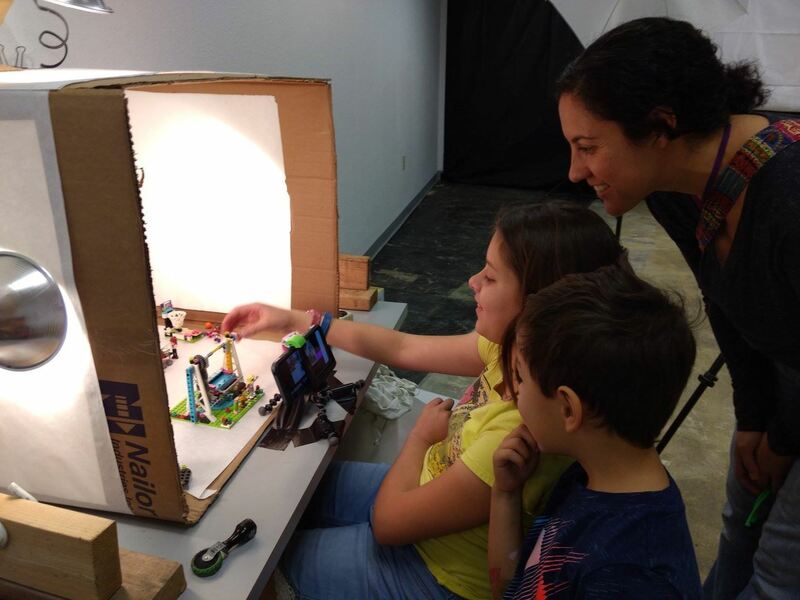 The film series is a part of a larger initiative by the makerspace called “Meet the Makers.” The goal of the program is to raise awareness around the skilled and creative talents living within Las Cruces and its surrounding territories through promotional materials and events such as their inaugural Heritage Festival held earlier in the year. 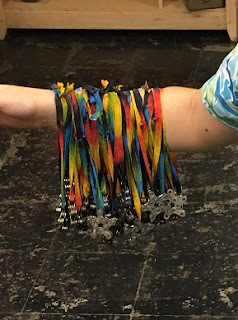 More information regarding the makerspace, their “Meet the Makers” initiative, and their numerous educational programs can be found on their website (https://crucescreatives.org) or their social media pages (https://facebook.com/crucescreatives, https://instagram.com/crucescreatives).